What is the antidote to a week of eating nothing but food from the sea (not that I was complaining)? A burger with the most amazing pub sauce ever!! I just returned from a week with the family down in gorgeous Cornwall. The scenery is stunning – cliffs, beaches, crashing waves, ancient castles. The food is pretty spectacular too, particularly the super-fresh seafood. Had off-the-boat lobsters delivered to our rental house one night, then all sorts of other seafood the other nights – whole-roasted plaice (so good I had it twice), chili crab, fish cakes, fish ‘n chips, oysters, mussels, smoked mackerel…..
After all that amazing seafood, I returned home seriously craving red meat. And a proper burger fit the bill. My absolute favorite burger recipe is from Cooks Illustrated and involves chilling beef tips or short ribs, grinding chilled meat in a food processor and finally adding melted butter. It is the best at-home burger I’ve ever had, hands-down. Just takes a bit more work than I was ready to handle just coming off of vacation. So instead I opted for store-ground meat and dressed it up with this burger-transforming “pub sauce”. It’s also from Cooks Illustrated – it accompanies the aforementioned home-ground burger. The sauce is not particularly pretty to look at, but will transform your garden variety beef burger into something pub-worthy. It’ll be a double-napkiner. And don’t just limit it to the burgers…dip your fries, vegetables, anything, in it as well. Note: Use any remaining pub sauce as a dip for fries or potato wedges. 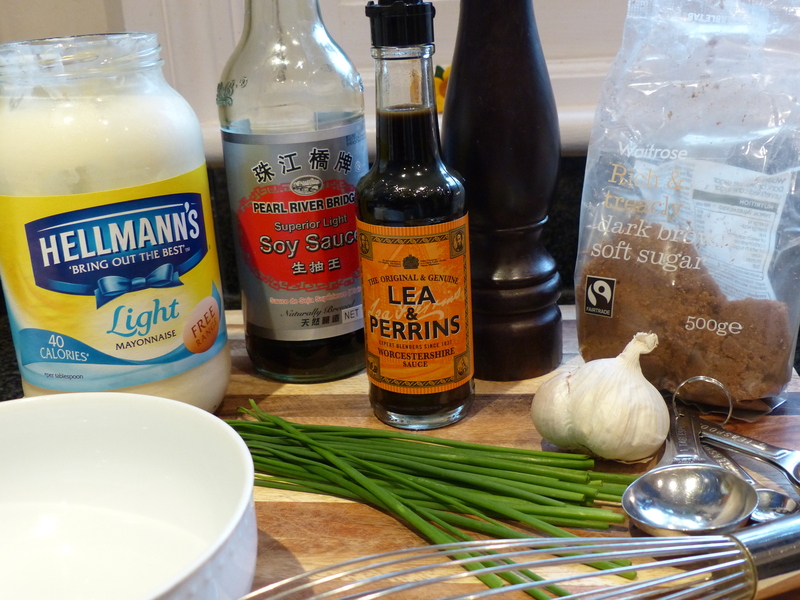 To make the pub sauce: Combine all of the ingredients in a medium bowl and whisk together until combined. To make the burgers: Season hamburger patties with salt and pepper. Cook hamburger patties on a hot grill or in a large saute pan on the stove over medium-high heat, to desired doneness (about 4 minutes per side for medium-rare, 5 minutes per side for medium). If making cheeseburgers, place cheese atop the burgers for the last 2 minutes of cooking. After burgers are cooked, toast buns on the grill or in the saute pan (if using saute pan, wipe away hamburger grease with paper towel / kitchen roll before placing buns in the pan). Place burgers in the toasted buns, add desired toppings and a dollop or two of pub sauce. When I first heard about grilled salad I thought it sounded totally cool, but I was skeptical. Seemed a bit too gimmicky. One of those, “it’s halfway through the summer and I’m sick of the same-old green salad , so let’s try something else….ANYTHING else, to get us out of the same-old salad rut”. This salad is the real deal. 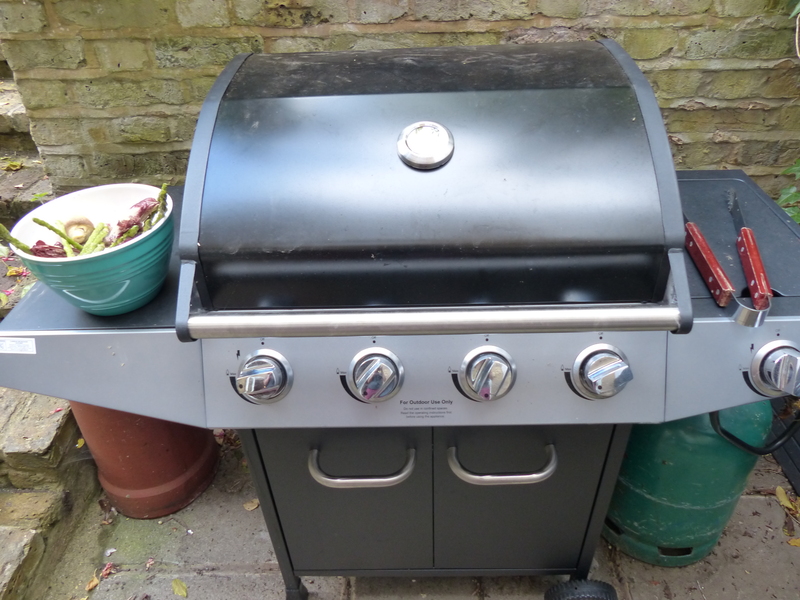 Grilling the radicchio (or red chicory/endive if you live in the UK and can’t get radicchio…or at least I haven’t found it…so if anyone in the London area has found it, let me know!) removes the bitterness therefore allowing it to be the one and only green of the salad as opposed to its typical second-fiddle roll, tossed along with other greens such as romaine or rocket in bagged salads. If making at a BBQ, grill the salad before the meat. While the meat cooks, let the veg cool down a bit before you chop them. A tip for the asparagus….to trim off the woody, thick ends just hold a stalk and gently apply pressure to the end until it snaps. It should naturally snap where the woody bit begins. Cool trick! Another tip, to get nice parmesan curls use a vegetable peeler. This salad tastes best at room temp or even slightly warm. Now enough for the tips, get grilling! Also, I’m very excited to announce that I’ll be attending my first food blogger conference this fall in London….conveniently a mile down the road from my house. How could I not go? Note: You don’t see grilled salad every day, so this makes for a really interesting and dramatic presentation. If you don’t have a grill, use a heavy pan over high heat to “grill” the veg. Use a vegetable peeler to shave the parmesan. Heat a gas grill on high. Cut the radicchio / chicory in half lengthwise. Snap off tough ends off of the asparagus. 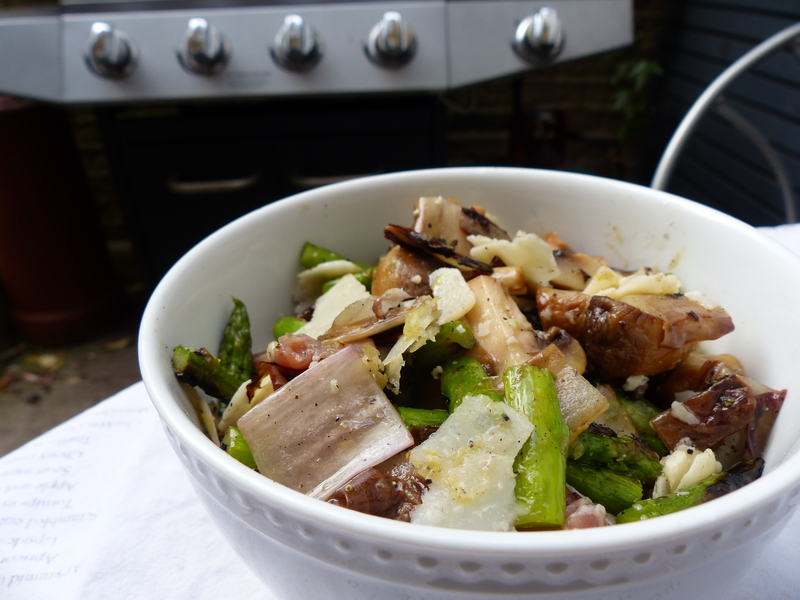 In a medium bowl, toss the radicchio, asparagus and mushrooms with 2 tablespoons olive oil, ¼ teaspoon salt, and a few grinds of black pepper. Grill, flipping as needed, until nicely marked all over and tender, about 4-5 minutes total. Place vegetables on a cutting board and let them cool a bit. Meanwhile, using the same medium bowl, make the vinaigrette by whisking the remaining 2 tablespoons olive oil with the lemon zest, lemon juice, sugar, ¼ teaspoon salt and a few grinds of black pepper. Core the radicchio. 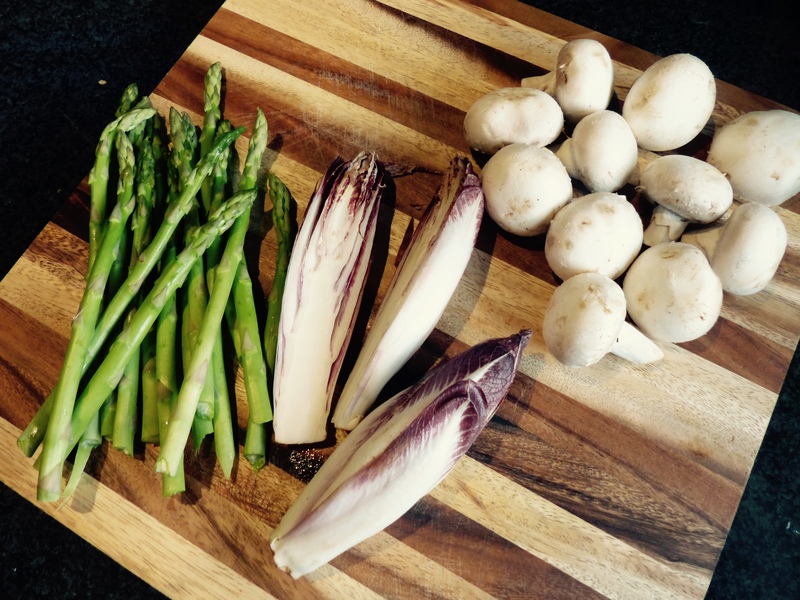 Cut the radicchio, asparagus and mushrooms into pieces about 1 inch (2.5 cm) pieces. Return to the bowl with the vinaigrette and toss along with the prosciutto and parmesan. Proscuitto may clump a bit. If so, just separate with your fingers. Serve at room temperature. If you’ve never tried chimichurri before, you must stop and make it now! Sorry to be bossy, but it packs mucho flavor and livens up whatever it’s drizzled over. 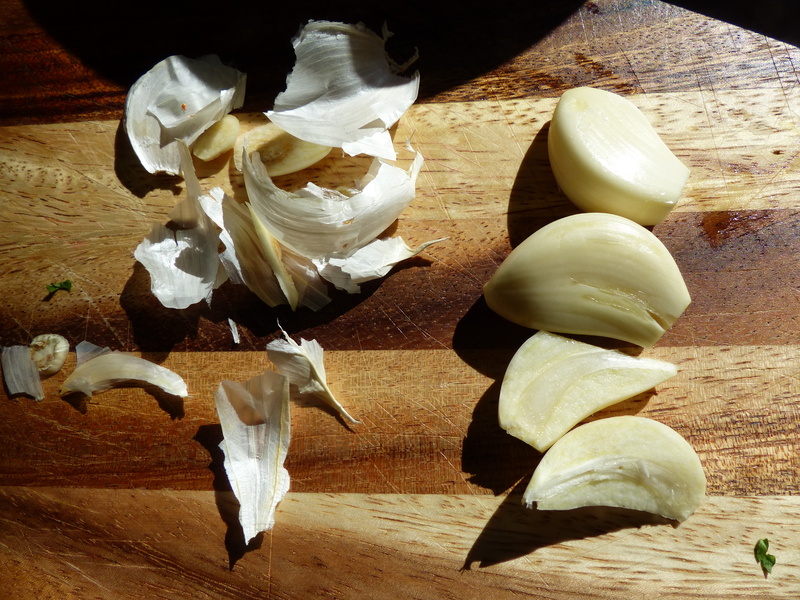 Try it on roasted vegetables, grilled meat or fish, scrambled eggs, even over noodles for a cold pasta salad. But if I had to chose, it’s at its best when paired with a nice steak. So what exactly is this chimi stuff? It’s an Argentinian condiment (think their version of ketchup) made with lots of parsley and garlic, red wine vinegar and olive oil, plus some red pepper flakes for a bit of heat. If you have several red wine vinegars on hand (which I realize most people don’t, including myself at the moment) use your best one. I first made chimichurri when I was the lucky recipient of a bottle of specialty red wine vinegar from Zingerman’s. I was trying to figure out how best show off its tang and subtle sweetness and I discovered chimichurri. 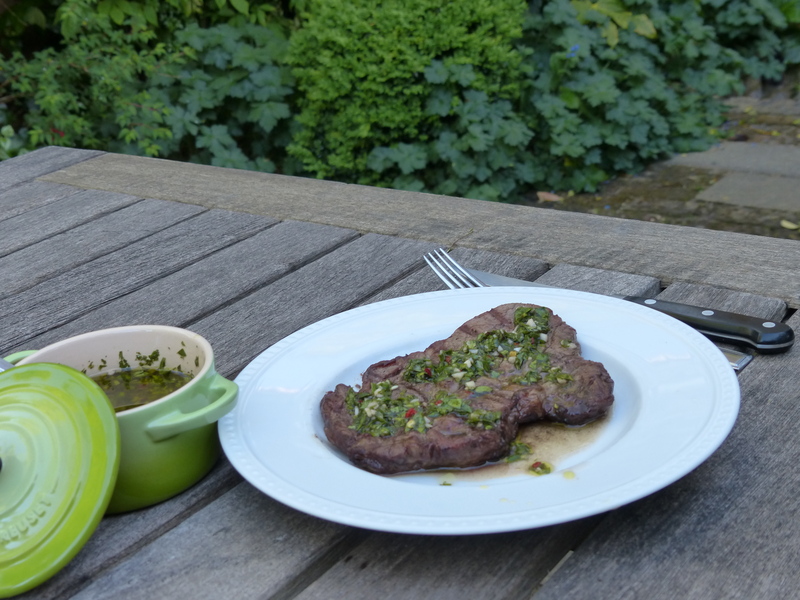 As I mentioned earlier, chimichurri is at it’s best when paired with a nice steak. I’m currently loving boneless ribeyes from our local butcher – but any steak will do – rubbed with some olive oil and a bit of salt and pepper. No marinade required. Just grill them up, slap them on your plate, drizzle with some chimichurri and you have summertime grilling perfection. Note: Unused chimichurri can be kept in the refrigerator for up to 3 days at which point the olive oil will start solidifying. However, if desperate you can heat it with very low heat (I use the microwave) until the oil melts. But I’m sure your chimichurri will be long gone before you reach that point. Stir the red wine vinegar, water, garlic, bay leaf, salt, chili flakes and pepper together in a small-medium bowl (it has to be large enough for you to be able to whisk in the olive oil). Drizzle in the olive oil, while whisking continuously. Stir in the parsley. Let sit for at least 30 minutes at room temperature before serving. Rub the steaks with a bit of olive oil and season with salt and pepper. If using a grill, grill until your desired doneness (I prefer medium-rare). If you don’t have a grill, no worries. Just heat a large, heavy saute pan over high heat. Add a drizzle of olive oil. Place steaks in the pan and cook 2-3 minutes per side until it reaches desired doneness. Be sure to turn the stove fan on, as it may get hot and smoky. Serve each steak drizzled with a tablespoon or two of chimichurri.